Drain pump fitted as standard. 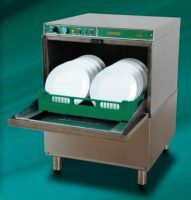 User friendly ONE TOUCH control panel with digital wash and rinse temperature displays for easy HACCP recording. 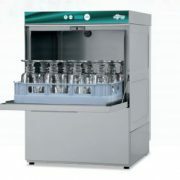 Built-in detergent and rinse aid dispensers fitted as standard. 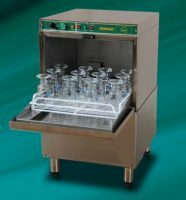 Supplied with 430 x 360mm (17″ x 14″) glass rack, will also take 14″ x 14″ and 400 x 400mm dish racks. Up to 1200 glasses per hour. Compartmented racks available to suit tall stem glasses. Water saving – uses only 1.9 litres per cycle . Three wash cycles of 60, 90 & 120 seconds . 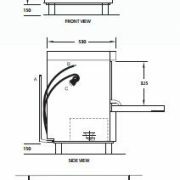 Generous 325mm door height opening will take a variety of glassware including the tallest of stemware and large jugs. Supplied with power cord, water & drain hoses, detergent, rinse aid & drain pumps. Simple & quick installation, no commissioning required. Self cleaning cycle, easily removable spray arms & filters together with a pressed wash tank. Double skinned door drastically reduces heat & sound emissions. Self-Diagnostic system for accurate fault finding & reduced ownership costs. Thermostop Function to ensure set rinse temperature is achieved. 4 x 150mm legs included (optional use). Quality European made built to Eswood specifications. 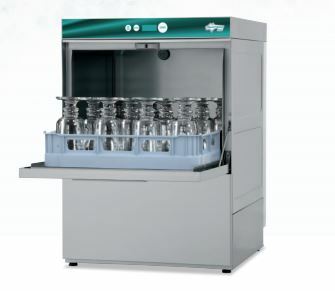 Up to 1800 Glasses per hour . ES25 – 1 Phase – 540 pieces per hour – Rinse pump fitted as standard. Durable stainless steel wash and rinse arms.